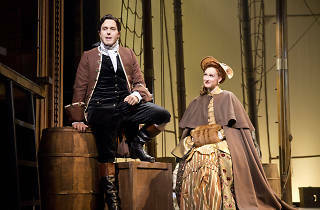 "It's actually amazing that it's never been made into a musical before," says Josh Young of the life of John Newton. "As far as I'm concerned the source material, his life story, is like musical theater gold. It's the stuff that musical theater is made for." Newton, an Englishman who lived from 1725 to 1807, was born into a family of slave traders and captained slave ships himself before later becoming a leading abolitionist, as well as the author of a number of enduring Christian hymns, including "Amazing Grace." 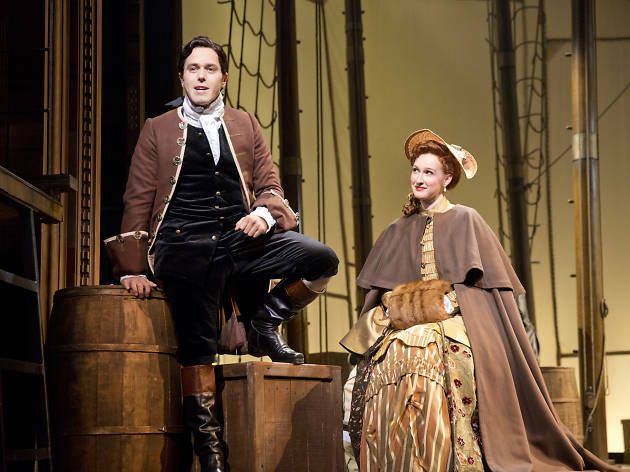 Young, who earned a 2012 Tony nomination for his Broadway debut in Jesus Christ Superstar, and was seen in Chicago last year as Che in the national tour of Evita, portrays Newton in the new biographical musical Amazing Grace at the Bank of America Theatre. Another rising Broadway star, Erin Mackey, plays Newton's love interest, Mary Catlett. Sitting in the theater's dress circle recently during a break from rehearsal, the two actors chatted about the show. "I didn't know who he was. Americans don't know who he is, and it's kind of crazy, because I don't think any of us would be exactly where we are in terms of the butterfly effect of one person—what he did really rippled throughout," says Young, who's been attached to the project since its first reading in 2009. "He actually planted the seeds for the abolition of slavery in Europe and over in America." "Our show really focuses in on a couple years of his life that were really pivotal, really helped form him to be the man that would write 'Amazing Grace,'" says Mackey, whose character "was the childhood sweetheart and always believed in him, believed that he could get out of all the dark, tumultuous troubled places he was in." "John wrote that every choice he ever made was dictated by the pangs of love for Mary," Young chimes in. "So Erin makes her worthy of that love as an actress." While the show's producers have designs on a Broadway bow (though no dates have been announced), its driving force, composer, lyricist and co-writer Christopher Smith, is an unknown name, a former police officer from Pennsylvania. (Playwright Arthur Giron has helped shape the book.) Young and Mackey agree, though, that Smith is ready for the big leagues. "In New York, I founded this company called Cutting Edge Composers—we have a weekly webisode on BroadwayWorld.com to expose new musical talent to the world," Young notes. "So I'm always like, Yes, please, give me somebody new. I love doing revivals and stuff, but the exciting thing about doing musical theater is there's always new talent out there." Young recalls first hearing demos of Smith's score played for him at his audition for the initial reading. "It was just these gorgeous, lush, sweeping, epic melodies. I never really thought twice about it, because I just loved the music so much." "He's incredibly talented," Mackey concurs. "And this has been such a passion project for Chris, too—he knows everything there is to know about John Newton and this time." "It was one of those things where the stars just aligned in the right way for him," Young says. "Carolyn [Rossi Copeland], our producer, was in the right place at the right time and heard this, and said, I'm taking you and we're making this musical." The show deserves to be done at a Broadway scale, the actors insist. "It's an epic show, it's a big show, and it's wonderful that it's being done in the right way, you know. We're not cutting corners," says Mackey. "It's the biggest musical I've ever been a part of, or seen. I've never seen anything to this scope that we're doing," Young adds. For now, they say, they're concentrating on getting the show right for Chicago. And Mackey, who lived here for two years while playing Glinda in the Chicago production of Wicked, says she's ready to hit the new restaurants that have opened since her time here. "All I do is talk about food," she says, laughing. "I wish I wasn't wearing a corset in this so I could just eat constantly." As for Newton's Amazing story, she says, "it's stranger than fiction some of the stuff that really happened in his life. It's really unbelievable." "He should have died, like, a bunch of times," Young adds with a grin. "We can only put a few of them in the show."